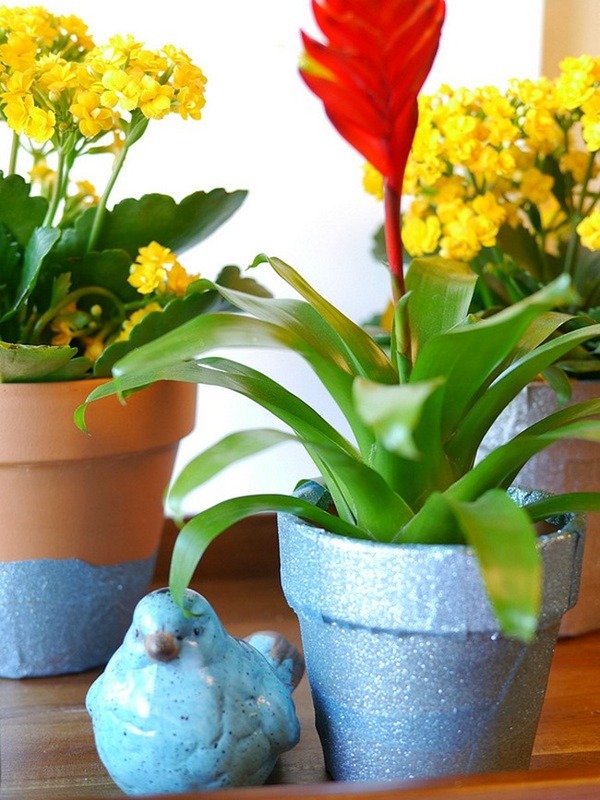 Add a little spring bling to your boring and beat up old flower pots! If you’re looking for a super easy project with a big impact…this is it! Duck Brand® sent me this amazing glitter craft tape to try. Well, I was thrilled to make something sparkle with this fun stuff. 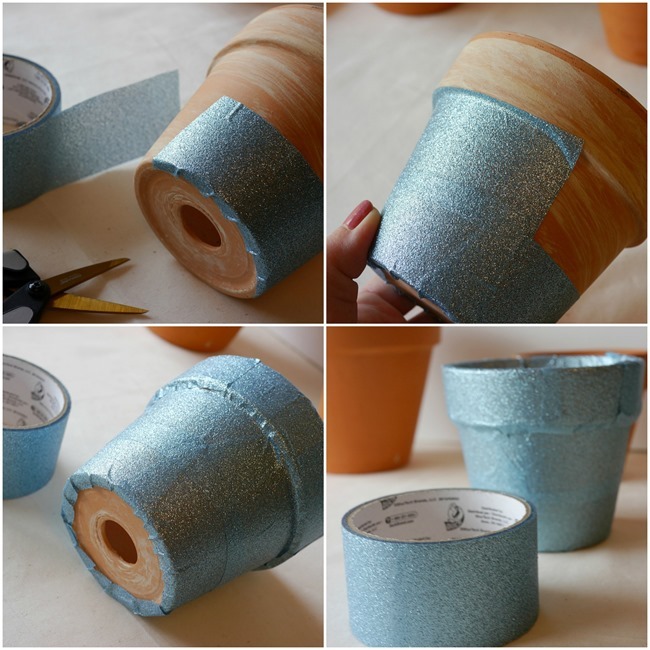 Adding a line of glitter tape is sheer genius. I absolutely love it…just in case you couldn’t tell! I’ve been working on freshening up the sad little flowers on my back porch. 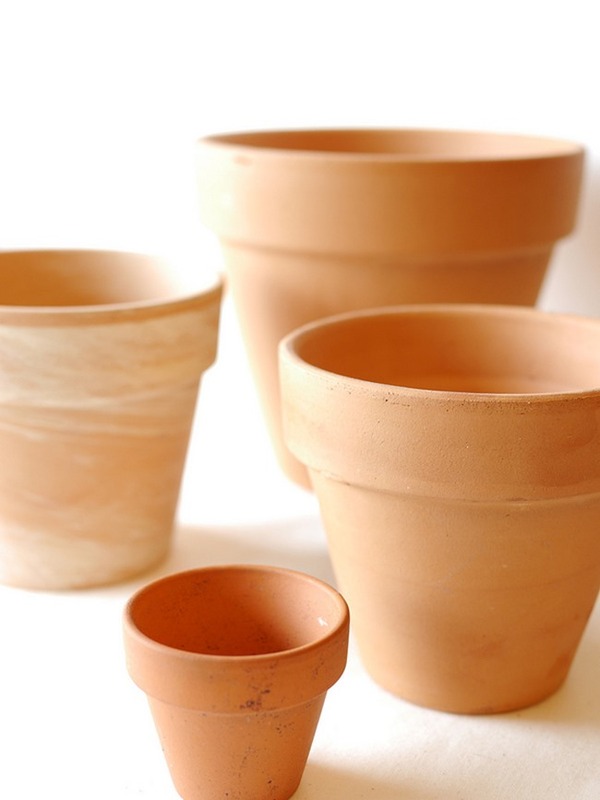 I have so many clay pots and random plastic pots…they all kind of look the same. I decided to add a little bling to a few of them, and I’m so glad I did! I made one covered completely with light blue tape, one with silver, and the other one I gave a “dipped in” look by only working with the bottom. I added slight curves to the last row. I started with cheap clay pots and one old plastic one. 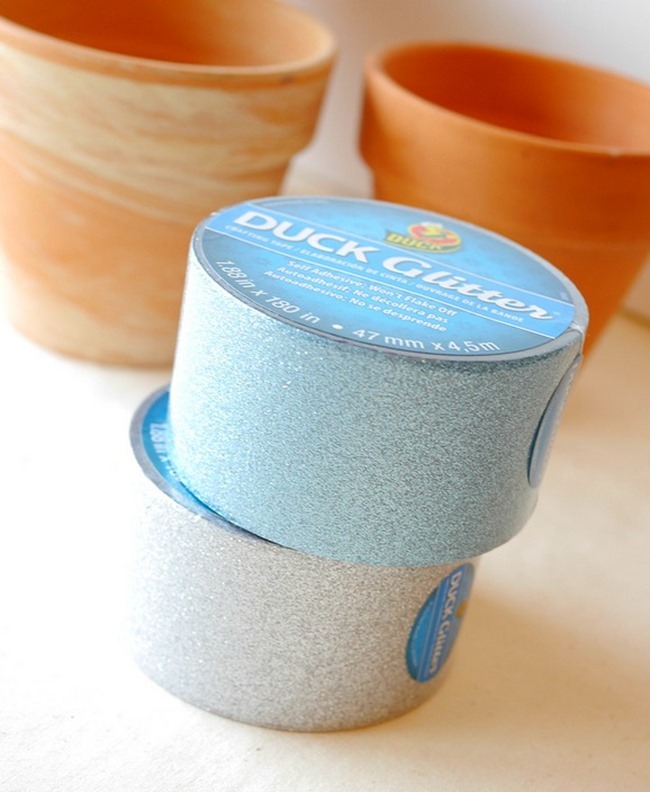 There are only two supplies…pots and this amazing Duck Brand® Craft Tape in all its gllittery goodness! How cool is that??? I started at the bottom and cut small pieces of tape to help me easily work with the curves. I just tucked it under the bottom, and now it won’t scratch up your table. Keep working your way up and tuck it around the top of your pot. Once I was done I went back to smooth it out a bit. Just press it down hard. It took 5 minutes per pot! That rocks! I do have a second little pot inside of these that these flowers came it. I can switch them out whenever and I can water them without getting the clay post soaked. The plastic pot with the silver tape doesn’t have a second layer, but I’m not worried about that one getting too wet. 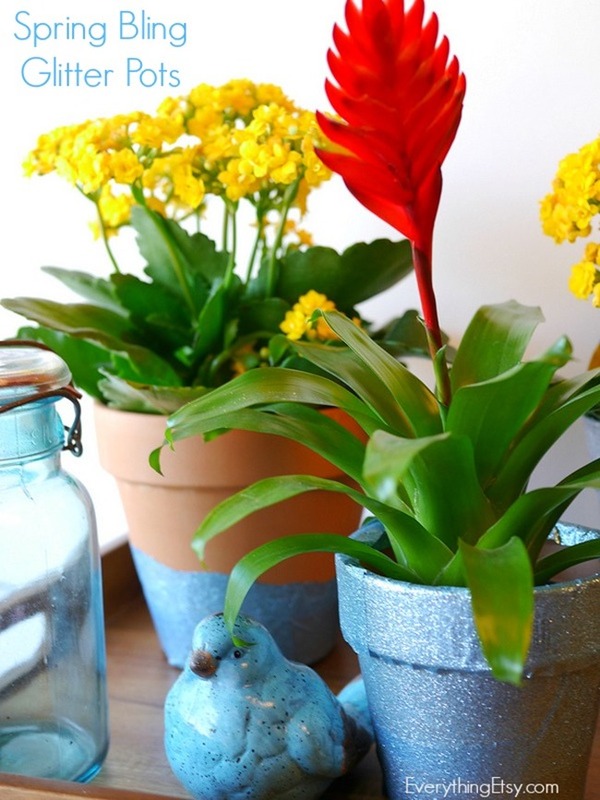 This is an amazing way to freshen up your plants for spring! You can find this tape in pink, silver, aqua and red…woot! It was simple to use and no mess at all! Get more ideas and tips by following @TheDuckBrand on Twitter! Just add a little bling with Duck Brand® Craft Tapes! 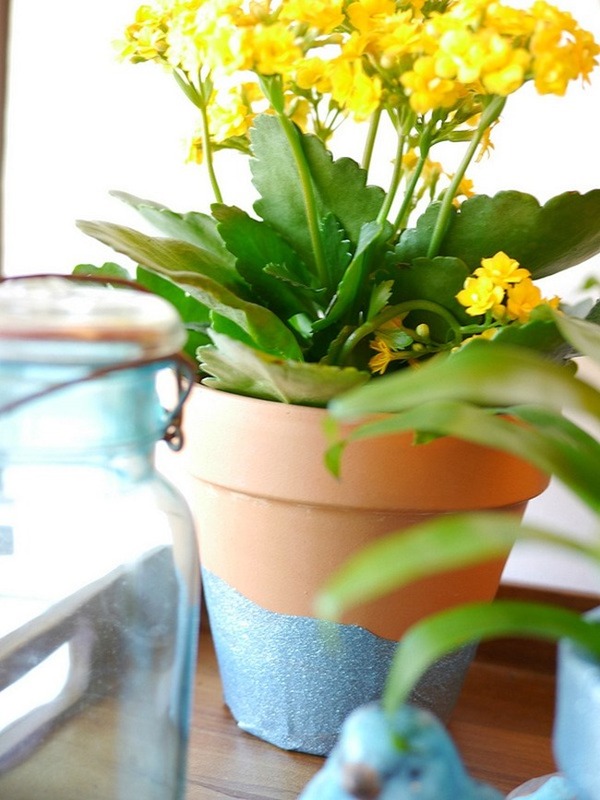 Have you been working on spring projects? We have only just got coloured duck tape in the UK – for years we have only ever been able to get the standard grey!! Glitter tape sounds brilliant. Oh, I’m sorry to hear that…I’m sure it will be there soon and you’ll already have some ideas! You know what you do have that we don’t?? Big Kat bars! Yum!